1941-1996 Rear Wheel Drive only. Packages come complete with radial or bias ply tires. Ready to bolt on to your special Cadillac. 1955-1967 and selected later models. 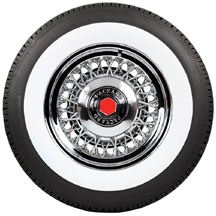 Packages include wheels with tires, mounted and ready to install. 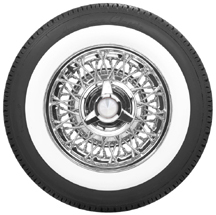 Chevrolet, Pontiac and Oldsmobile wire wheels with whitewall tire packages. Mounted and balanced and ready to install on your car. Ford, Lincoln, Mercury and Edsel wheel and tire packages. Wheels and tires arrive mounted and balanced and ready to install on your car. 1938-1956 and selected Packard models. Wire wheel and whitewall tire packages. Wheels and tires are expertly mounted and balanced and shipped to you, ready to bolt on.